The Third Republic of France was characterized by weak and short-term governments. 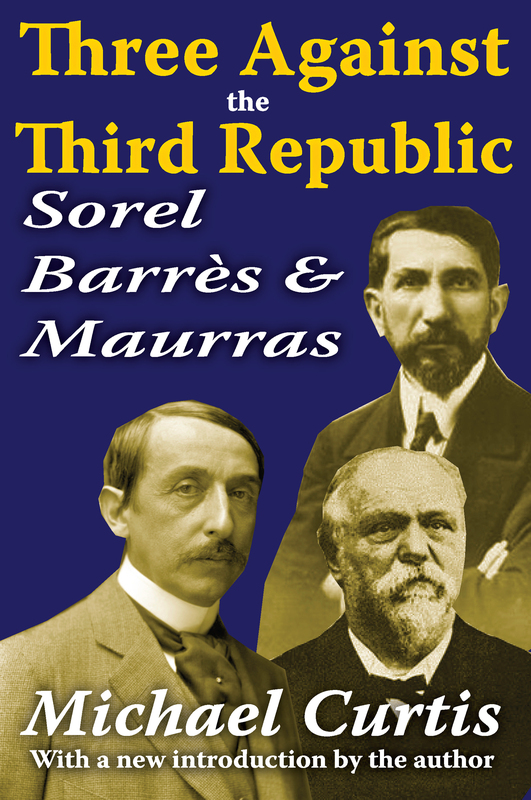 This book is a study of three writers, Georges Sorel, Maurice Barres, and Charles Maurras, their writings in the years between 1885 and 1914, and their reactions to the deficiencies they saw in the Third Republic and in the system of French democracy. The study begins in 1885 with the appearance of certain new political factors. It ends in 1914 because the three writers had by this time completed their original contributions to the thought of the country, even if not their total impact on France.A relative position of each of these figures in the French political spectrum is deduced from a combination of attitudes toward a number of issues. These include the extent of economic and social reform, centralization of the power of the state, the nature of the parliamentary system, the desirability of political parties, the relation of Church and State, the responsibility of authority, the use of force or coercion, and national power versus international collaboration. Their views span the political spectrum.Sorel, Barres, and Maurras are important not only because they provided the chief ideological weapons for the attack on the regime but also, in a wider context, because they contribute significantly to understanding of a later period of European political history. In their contemporary significance, all three illustrated the various attitudes of the conservative, the .reactionary, and the moralist. The names and parties may have changed but the same ideas continue to impact French politics and western ideology today. This is a key book for an epoch whose importance lingers in current discourse.